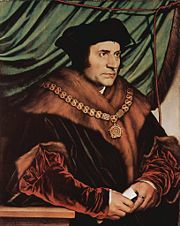 Sir Thomas More ( February 7, 1478 - July 6, 1535) was an English lawyer, author, statesman, and a Catholic martyr. During his lifetime he earned a reputation as a leading humanist scholar at Oxford university and occupied many public offices, including that of Lord Chancellor from 1529 to 1532. He is recognized as having a major influence on developing equity as an additional legal system in English law. More coined the word "utopia," a name he gave to an ideal, imaginary island nation whose political system he described in a book published in 1516. He is chiefly remembered for his principled refusal to accept King Henry VIII's claim to be the supreme head of the Church of England, a decision which ended his political career and led to his execution as a traitor. In 1935, four hundred years after his death, More was canonized in the Catholic Church by Pope Pius XI, and was later declared the patron saint of statesmen and lawyers. He shares his feast day, June 22 on the Catholic calendar of saints, with Saint John Fisher, the only Bishop during the English reformation to refuse to deny the Catholic faith and allegiance to the Pope. He was added to the Anglican Churches' calendar of saints in 1980. While still a child Thomas More was sent to St. Anthony's School, kept by Nicholas Holt, and when thirteen years old became a page in the service of John Morton, the Archbishop of Canterbury, who declared that young Thomas would become a "marvellous man." Thomas attended the University of Oxford from about 1492 for two years as a member of Canterbury Hall (subsequently absorbed by Christ Church, where he studied Latin and logic. He also studied French, history, and mathematics, and also learned to play the flute and the viol. He then returned to London, where he studied law with his father and was admitted to Lincoln's Inn in 1496. More wrote poetry in Latin and English, and published a translation of the life of Pico della Mirandola. His former tutors, Grocyn and Linacre, who were now living in London, introduced him to Colet, Dean of Saint Paul's, and William Lilly, both renowned scholars. Colet became More's confessor and Lilly vied with him in translating epigrams from the Greek Anthology into Latin; their collaborative work (Progymnasnata T. More et Gul. Liliisodalium) was published in 1518. In 1497 More began a friendship with Erasmus; later Erasmus spent several long visits at More's Chelsea house, and they carried on a lifelong correspondence. Between 1499 and 1503, More delivered a series of lectures, now lost, on Saint Augustine's De civitate Dei at the Church of St. Lawrence Jewry. During this period, to his father's great displeasure, More seriously contemplated abandoning his legal career in order to become a monk. He lodged at the London Charterhouse for four years and he also considered joining the Franciscan order. More finally decided to marry in 1505, but for the rest of his life he continued to observe ascetic practices, including self-punishment: he wore a hair shirt every day and occasionally engaged in flagellation. More had four children by his first wife, Jane Colt, who died in 1511. He remarried almost immediately, to a rich widow named Alice Middleton who was several years his senior. More and Alice Middleton did not have children together, though More raised Alice's daughter, from her previous marriage, as his own. More provided his daughters with an excellent classical education, at a time when such learning was usually reserved for men. In 1501, More was elected a member of Parliament. He immediately began to oppose the large and unjust exactions of money which King Henry VII was demanding from his subjects. Henry demanded from the House of Commons a grant of three-fifteenths, about 113,000 pounds, but due to More's protests the Commons reduced the sum to 30,000. Some years later Dudley, the Speaker of the House of Commons, told More that he was only saved from being beheaded by the fact that he had not attacked the king in person. As it was, Henry was so enraged with More that he "devised a causeless quarrel against his father, keeping him in the Tower till he had made him pay a hundred pounds fine" (Roper). More now had a reputation as a lawyer. From 1510 to 1518, More served as one of the two Undersheriffs of the city of London, a position of considerable responsibility, and was chosen by Cardinal Wolsey in 1515 to participate in an embassy to Flanders to protect the interests of English merchants. During the six months of his absence, he made the first sketch of the Utopia, his most famous work, which was published the following year. Cardinal Wolsey and the king were anxious to secure More's services at Court. In 1516 he was granted a pension of 100 pounds for life, and in 1517 he was made a member of the embassy to Calais and became a privy councilor. In 1519 he resigned his post as Under-Sheriff and became completely attached to the Court. In June, 1520, he was in Henry's suite at the "Field of the Cloth of Gold," and in 1521 was knighted and made sub-treasurer to the king. When the Emperor Charles V visited London in the following year, More was chosen to deliver the Latin address of welcome; the king also showed his favor by making him grants of land in Oxford and Kent. In 1523 he was elected Speaker of the House of Commons on Wolsey's recommendation; became High Steward of Cambridge University in 1525; and in the same year was made Chancellor of the Duchy of Lancaster, to be held in addition to his other offices. The king would sometimes come unannounced to have dinner at More’s mansion in Chelsea, and would walk around the gardens, arm-in-arm with him, enjoying his conversation. More became involved in the Lutheran controversy which had now spread through Europe, writing defenses of Catholicism first in Latin and later in English, which could be read by people of all classes. On the death in 1502 of Henry's elder brother, Arthur, Prince of Wales, Henry became heir apparent to the English throne. Henry was attracted to his brother's widow, Catherine of Aragon, daughter of the Spanish king, and wanted to marry her as a means of preserving the English alliance with Spain. Pope Julius II issued a formal dispensation from the biblical injunction (Leviticus 20:21) against a man marrying his brother's widow, based partly on Catherine's testimony that the marriage between her and Arthur had not been consummated. The marriage of Henry VIII and Catherine went smoothly for nearly 220 years, but Catherine failed to provide a male heir and Henry eventually became enamored of Anne Boleyn, one of Queen Catherine's ladies-in-waiting. In 1527, Henry instructed Cardinal Wolsey to petition Pope Clement VII for an annulment of his marriage to Catherine of Aragon, on the grounds that the pope had no authority to override a biblical injunction, making his marriage to Catherine invalid. The pope steadfastly refused to grant such an annulment. Henry reacted by forcing Wolsey to resign as Lord Chancellor and appointing Thomas More in his place in 1529. Henry then began to embrace the Protestant teaching that the Pope was "only" the Bishop of Rome and therefore had no authority over the Christian Church as a whole. More, until then fully devoted to Henry VIII and to the cause of royal prerogative, initially cooperated with the king's new policy, denouncing Wolsey in Parliament and proclaiming the opinion of the theologians at Oxford and Cambridge that the marriage of Henry to Catherine had been unlawful. As Henry began to deny the authority of the Pope, however, More's became uneasy. More had come to believe that the rise of Protestantism represented a grave threat to social and political order in Christian Europe. During his tenure as Lord Chancellor, he wrote several books in which he defended Catholicism and supported the existing anti-heresy laws. More decided that it was necessary to eliminate the collaborators of William Tyndale, the exiled Lutheran who had published a Protestant translation of the Bible in English (1525) which was circulating clandestinely in England. As Lord Chancellor, More had six Lutherans burned at the stake and imprisoned as many as 40 others, some of whom were interrogated under torture in his own house. In 1530, More refused to sign a letter by the leading English churchmen and aristocrats asking the Pope to annul Henry's marriage to Catherine. In 1531 he attempted to resign after being forced to take an oath declaring the king the supreme head of the English church "as far the law of Christ allows." In 1532 he asked the king again to relieve him of his office, claiming that he was ill and suffering from sharp chest pains. This time Henry granted his request. In 1533, because of his friendship with the old queen, Catherine of Aragon, More refused to attend the coronation of Anne Boleyn as the Queen of England. Technically, this was not an act of treason because More had written to Henry acknowledging Anne's queenship and expressing his desire for their happiness. More wrote that he, "neither murmur at it nor dispute upon it, nor never did nor will … [I] faithfully pray to God for his Grace and hers both long to live and well, and their noble issue too…" (E.W. Ives, The Life and Death of Anne Boleyn, 47). His failure to attend her coronation was widely interpreted as a snub against her. Shortly thereafter More was charged with accepting bribes, but the patently false charges had to be dismissed for lack of any evidence. In 1534 he was accused of conspiring with Elizabeth Barton, a nun who had prophesied against the king's divorce, but More was able to produce a letter in which he had instructed Barton not to interfere with state matters. On April 13 of that year, More was asked to appear before a commission and swear his allegiance to the parliamentary Act of Succession. More accepted Parliament's right to declare Anne the legitimate queen of England, but he refused to take the oath because of an anti-papal preface to the Act asserting Parliament's authority to legislate in matters of religion by denying the authority of the Pope. Four days later, he was imprisoned in the Tower of London, where he wrote his devotional Dialogue of Comfort Against Tribulation. On July 1, 1535, More was tried before a panel of judges that included the new Lord Chancellor, Sir Thomas Audley, as well as Anne Boleyn's father, brother, and uncle. He was charged with high treason for denying the validity of the Act of Succession. More believed he could not be convicted as long as he did not explicitly deny that the king was the head of the church, and he therefore refused to answer all questions regarding his opinions on the subject. Thomas Cromwell, at the time the most powerful of the king's advisors, brought forth the Solicitor General for England and Wales, Richard Rich, to testify that More had, in his presence, denied that the king was the legitimate head of the church. This testimony was almost certainly perjured (witnesses Richard Southwell and Mr Palmer both denied having heard the details of the reported conversation), but on the strength of it the jury voted for More's conviction. Before his sentencing, More spoke freely of his belief that "no temporal man may be head of the spirituality." He was sentenced to be hanged, drawn, and quartered (the usual punishment for traitors) but the king commuted this to execution by beheading. The execution took place on July 6,1535. When he came to mount the steps to the scaffold, he is widely quoted as saying to the officials, "See me safe up: for my coming down, I can shift for myself"; while on the scaffold he declared that he died "the king's good servant but God's first." Another belief is that he remarked to the executioner that his beard was completely innocent of any crime, and did not deserve the ax; he then positioned his beard so that it would not be harmed. More's body was buried at the Tower of London, in the chapel of St. Peter ad Vincula. His head was placed over London Bridge for a month and was rescued by his daughter, Margaret Roper, before it could be thrown in the River Thames. The skull is believed to rest in the Roper Vault of St. Dunstan's, Canterbury. Woodcut by Ambrosius Holbein for a 1518 edition of Utopia. The traveler Raphael Hythloday is depicted in the lower left-hand corner describing to a listener the island of Utopia, whose layout is schematically shown above him. More combined his busy political career with writing and scholarship which earned him a considerable reputation as a Christian humanist in continental Europe. His friend Erasmus of Rotterdam dedicated his masterpiece, In Praise of Folly, to him. (Even the title of Erasmus's book is partly a play on More's name, the word folly being moria in Greek.) In his correspondence with other European humanists, Erasmus also described More as a model man of letters. The humanistic project embraced by Erasmus and Thomas More sought to reexamine and revitalize Christian theology by studying the Bible and the writings of the Church Fathers in the light of classical Greek tradition in literature and philosophy. More and Erasmus collaborated on a Latin translation of the works of Lucian, which was published in Paris in 1506. His other works in Latin and English are a translation of The Life of John Picus, Earl of Mirandula (1510); a History of Richard III, upon which William Shakespeare based his play; a number of polemical tracts against the Lutherans (1528–1533); devotional works including A Dialogue of Comfort against Tribulation (1534) and a Treatise on the Passion (1534); poems; meditations; and prayers. Between 1513 and 1518, More worked on an unfinished History of King Richard III, which heavily influenced William Shakespeare's play Richard III. Both More's and Shakespeare's works are controversial among modern historians for their exceedingly unflattering portrayal of King Richard III of England, a bias due at least in part to the authors' allegiance to the reigning Tudor dynasty, which had wrested the throne from Richard at the end of the Wars of the Roses. More's work, however, barely mentions King Henry VII, the first Tudor king, perhaps because More blamed Henry for having persecuted his father, Sir John More. Some commentators have interpreted More's work as an attack on royal tyranny, rather than on Richard himself or on the House of York. 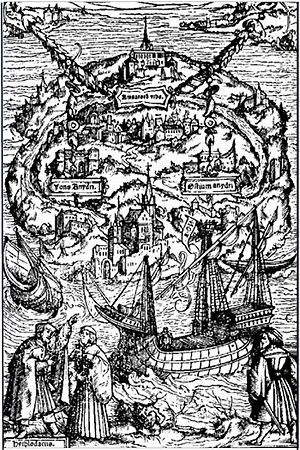 In 1515 More wrote his most famous and controversial work, Utopia, in which a fictional traveler, Raphael Hythloday (whose surname means "dispenser of nonsense" in Greek), describes the political arrangements of the imaginary island nation of Utopia (a play on the Greek ou-topos, meaning "no place," and eu-topos, meaning "good place"). In the book, More contrasts the contentious social life of European states with the perfectly orderly and reasonable social arrangements of Utopia, where private property does not exist and almost complete religious tolerance is practiced. Utopia was begun while More was an envoy in Flanders in May, 1515. More started by writing the introduction and the description of the society which would become the second half of the work and on his return to England he wrote the "dialogue of counsel," completing the work in 1516. That same year, it was printed in Louvain; More was not aware that the work would be published, but, after reading it, his friend Erasmus published it on his behalf. After revisions by More it was printed in Basle in November, 1518. It was not until 1551, 16 years after More's execution, that it was first published in England as an English translation by Ralph Robinson. Gilbert Burnet's translation of 1684 is probably the most commonly cited version. Utopia is largely based on Plato's Republic. The values of equality and pacifism are primary, although Utopia’s citizens are all ready to fight if necessary. The evils of society, such as poverty and misery, are all removed, and the few laws are so simple that everyone can understand and obey them. The society encourages tolerance of all religions, but not of atheism, since the people believe that a man must fear some God, or else he will act evilly and their society will weaken. More might have chosen the literary device of describing an imaginary nation primarily as a vehicle for discussing controversial political matters freely. His own attitude towards the arrangements he describes in the book is the subject of much debate. While it seems unlikely that More, a devout Catholic, intended his pagan, communal Utopia as a concrete model for political reform, some have speculated that More based his Utopia on monastic communalism, which resembles the Biblical communalism described in the Acts of the Apostles. The original edition included details of a symmetrical alphabet of More's own invention, called the "Utopian alphabet." This alphabet was omitted from later editions, though it remains notable as an early attempt at cryptography that may have influenced the development of shorthand. As Henry VIII's advisor and secretary, More helped to write the Defense of the Seven Sacraments, a polemic against Protestant doctrine that earned Henry the title of “Fidei defensor” (Defender of the Faith) from Pope Leo X in 1521. Both Martin Luther's response to Henry and Thomas More's subsequent Responsio ad Lutherum ("Reply to Luther") have been criticized for their intemperate ad hominem attacks. House of Thomas More in London. The steadfastness with which More held on to his religious convictions in the face of ruin and death and the dignity with which he conducted himself during his imprisonment, trial, and execution, contributed much to More's posthumous reputation, particularly among Catholics. More was beatified by Pope Leo XIII in 1886 and canonized with John Fisher after a mass petition of English Catholics in 1935, as a 'patron saint of politics' in protest against the rise of secular, anti-religious Communism. His joint feast day with Fisher is June 22. In 2000 this trend was continued, when Pope John Paul II declared Saint Thomas More the "heavenly Patron of Statesmen and Politicians." He even has a feast day, July 6th, in the Anglican church, though he has not been canonized by them. 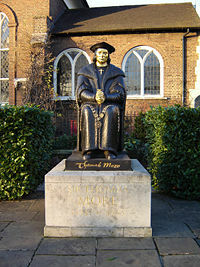 Statue of Thomas More in front of Chelsea Old Church, Cheyne Walk, London. More's conviction for treason was widely seen as unfair, even among Protestants. His friend Erasmus, who (though not a Protestant) was broadly sympathetic to reform movements within the Christian Church, declared after his execution that More had been "more pure than any snow" and that his genius was "such as England never had and never again will have." Many commentators have pointed out that Karl Marx's later vision of the ideal communist state strongly resembles More's Utopia in respect to the ownership of individual property, although Utopia is without the atheism that Marx always insisted upon. It is notable that Utopia is tolerant of different religious practices but does not advocate tolerance for atheists. More theorized that if a man did not believe in God or an afterlife of any kind, he could never be trusted as he would not be logically driven to acknowledge any authority or principles outside himself. As the author of Utopia, More has also attracted the admiration of modern socialists. While Roman Catholic scholars maintain that More's attitude in composing Utopia was largely ironic and that he was at every point an orthodox Christian, Marxist theoretician Karl Kautsky argued in the book Thomas More and his Utopia (1888) that Utopia was a shrewd critique of economic and social exploitation in pre-modern Europe and that More was one of the key intellectual figures in the early development of socialist ideas. The politics of Utopia have been seen as influential to the ideas of Anabaptism, Mormonism and Communism. An applied example of More's utopia can be seen in Vasco de Quiroga's implemented society in Michoacán, Mexico, which was directly taken and adapted from More's work. Other biographers, such as Peter Ackroyd, have offered a more sympathetic picture of More as both a sophisticated humanist and man of letters, as well as a zealous Roman Catholic who believed in the necessity of religious and political authority. The Thomas More Society is a legal aid organization that provides law services for those arguing conservative-aligned issues including teaching intelligent design in public schools. More was portrayed as a wise and honest statesman in the 1592 play Sir Thomas More, which was probably written in collaboration by Henry Chettle, Anthony Munday, William Shakespeare, and others, and which survives only in fragmentary form after being censored by Edmund Tylney, Master of the Revels in the government of Queen Elizabeth I. Any direct reference to the Act of Supremacy was censored out. This play also reflects his contemporary reputation among the people of London as a folk hero. Roman Catholic writer G. K. Chesterton called More the "greatest historical character in English history." Roman Catholic science fiction writer R. A. Lafferty wrote his novel Past Master as a modern equivalent to More's Utopia, which he saw as a satire. In this novel, Thomas More is brought through time to the year 2535, where he is made king of the future world of "Astrobe," only to be beheaded after ruling for a mere nine days. One of the characters in the novel compares More favorably to almost every other major historical figure: "He had one completely honest moment right at the end. I can't think of anyone else who ever had one." "More is a man of an angel's wit and singular learning. I know not his fellow. For where is the man of that gentleness, lowliness and affability? And, as time requireth, a man of marvelous mirth and pastimes, and sometime of as sad gravity. A man for all seasons." In 1966, Bolt's play was made into a successful film directed by Fred Zinnemann, adapted for the screen by the playwright himself, and starring Paul Scofield in an Oscar-winning performance. The film won the Academy Award for Best Picture for that year. Karl Zuchardt wrote a novel, Stirb Du Narr! ("Die you fool! "), about More's struggle with King Henry, portraying More as an idealist bound to fail in the power struggle with a ruthless ruler and an unjust world. ↑ James Wood. The Broken Estate, Essays on Literature and Belief. (Pimlico, 2000, ISBN 0712665579). ↑ Marvin O'Connell. A Man for all Seasons: an Historian's Demur. . Catholic Education Resource Center. Retrieved June 2, 2008. This page was last modified on 21 November 2014, at 21:37.